Provide comfort for the family of Audrey Thomas with a meaningful gesture of sympathy. Audrey Charlotte Thomas, 77, of Winchester, VA passed away on Thursday, January 31, 2019 in the Lynn Care Center, Front Royal, VA with her daughters at her side. She was born on April 22, 1941 in St. Stephen New Brunswick, Canada, and grew up in Fairhaven, Deer Island, Canada. The daughter of Bertha Calder and Harold W. Farris, a teacher and family businessman. Audrey graduated with a Bachelor of Arts from Acadia University in Wolfville, Nova Scotia. While at Acadia she met a tall, handsome basketball player, who became the love of her life. She and Charles Thorvald Thomas, Jr. were married on September 21, 1963 in Fairhaven, Deer Island. They were married 55 years, until Charles preceded her in death on September 29, 2018. Audrey was a pre-school teacher at Fairfax United Methodist Church and later a teacher’s aide with Fairfax County Public Schools at Greenbriar West, Virginia Run, and Willow Springs. Audrey was an active member at Fairfax United Methodist Church until she retired to Winchester, VA where she was an active member at Burnt Factory United Methodist Church. She is survived by her daughters, Jennifer L. Hudders (Wayne), of Fairfax, VA and Suzanne N. Herring (Mike), of Front Royal, VA; four grandchildren, Nicholas and Austin Herring of Front Royal, VA and R. Stone and Emily Hudders of Fairfax, Virginia; her sister in law, Theresa Farris, of Oakville, Ontario; brothers in law, V. Jaffrey Rice, of Bridgetown, Nova Scotia, and Robert Connell of Sandy, UT, and many nieces and nephews. She was preceded in death by her brother, Byron (Bud) Farris, sister, Janet Rice and sister-in-law Ann Connell. Audrey was known for quick wit and an unfiltered sense of humor. She was a founding member of a small group known as “The Church Ladies.” She had a deep sense of faith and unbinding love for the Lord. She adored her grandchildren and loved to watch them in various sports activities. She loved to travel, read on her Kindle, and listen to music. There will be a visitation from 12:30 to 2:00 pm on Saturday, February 23, 2019 at Burnt Factory United Methodist Church, 1943 Jordan Springs Road, Stephenson, VA 22656. A memorial service will follow at 2:00 pm with Pastor Steve Melester officiating. Memorial contributions may be given to Millwood Fire and Rescue, 250 Costello Drive, Winchester, VA 22602. To send flowers in memory of Audrey Charlotte Thomas (Farris), please visit our Heartfelt Sympathies Store. Joy and Bob Fuller, Love Jaff, Tom, Tim, Cynthia, Jerry and Family., and others have sent flowers to the family of Audrey Charlotte Thomas (Farris). Joy and Bob Fuller purchased the The FTD Truly Loved Basket for the family of Audrey Thomas. With deepest sympathy from the family of former Legato Road neighbors Jim & Luanne Lindquist. Heartfelt Sympathies Store purchased flowers for the family of Audrey Thomas. Love Jaff, Tom, Tim, Cynthia, Jerry and Family. For our dear sister in law and aunt. Love Jaff, Tom, Tim, Cynthia, Jerry and Family. 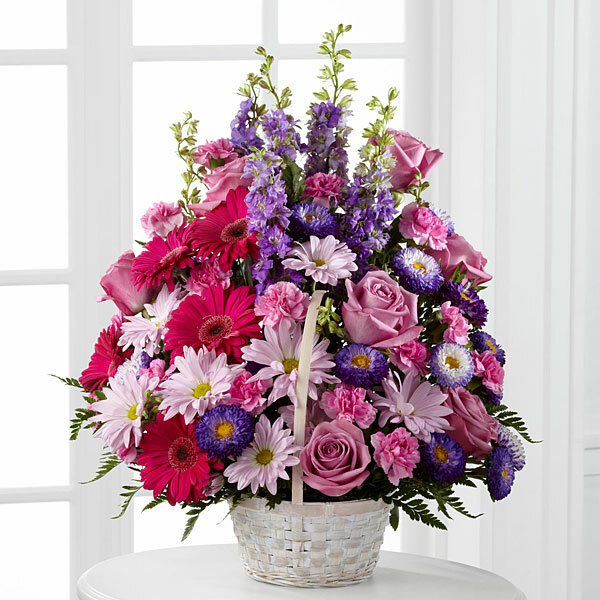 purchased the The FTD Deepest Sympathy Arrangement for the family of Audrey Thomas.